Pronouns are similar to names in that they are used to distinguish between different people. We, as a culture, tend to make an assumption about a person’s gender pronouns based on how we interpret their gender. This assumption should never be made as it is possible for us to misinterpret a person’s gender expression and make a false assumption. It is generally acceptable to politely and respectfully ask about a person’s pronouns. Many people choose to go by pronouns besides she/her and he/him such as they/them, ze/hir, co/cos, and many more. Just as you will never know a stranger’s name without asking, you will never know a person’s pronouns without asking. 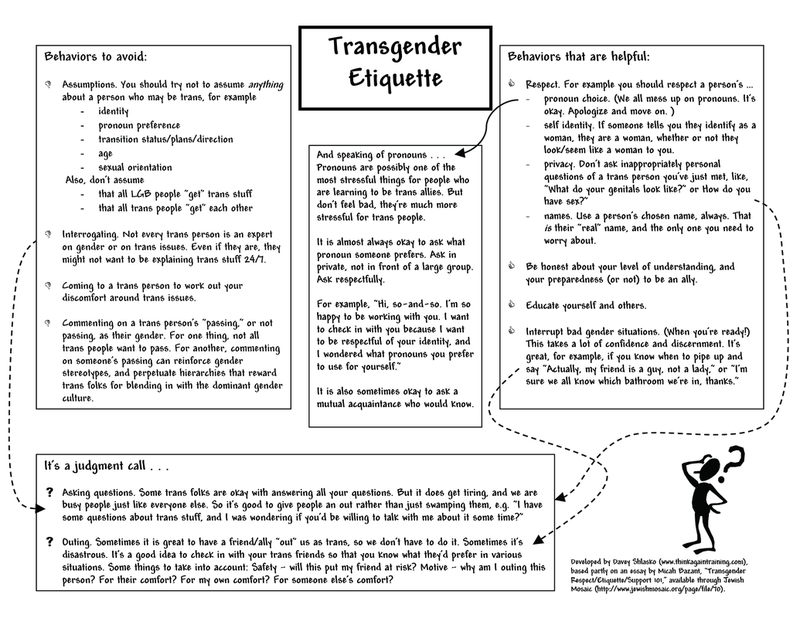 - Assumptions: You should not to assume anything about a person who may be trans. This includes assumptions about one's identity, pronoun preference, transition status/plans, age, or sexual orientation. - Venting about your issues with transness: Don't use a trans person to work out your discomfort around trans issues. - Commenting on a trans person's appearance: Especially regarding if they "pass" or not. Not all trans people want to pass, and commenting on it reinforces gender stereotypes and hierarchies. - Respect: you should respect a person's pronoun choice, identity, privacy, and names. Don't ask invasive or personal questions of a trans person you've just met. -Be Honest: Be upfront about your level of understand of trans things. Share your willingess (or unwillingness) to be an ally. - Educate yourself and others. -Interrupt bad gender situations: This takes a lot of confidence and discernment. It's great to stand up for trans people whenever you can. -Stating your own pronouns when introducing yourself encourages others to do the same.